D. Foskett, A Dictionary of British Miniature Painters, London, 1972, I, p. 299. D. Foskett, Collecting Miniatures, Woodbridge, 1979, p. 178, illustrated opp. p. 157, colour pl. 11B. D. Foskett, Miniatures: Dictionary and Guide, Woodbridge, 1987, p. 178, 552, illustrated opp. p. 157, colour pl. 11B. 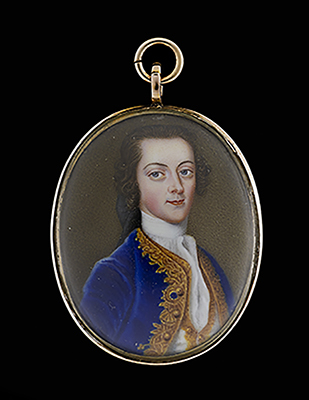 The sitter in this enamel, Walter Edwards Freeman, was part of a group of family miniatures brought to Sotheby’s in 1966. One of this group, probably depicting his son Thomas Edwards Freeman, was signed in full on the reverse by Groth, allowing Daphne Foskett to solve the mystery of the artist of those enamels all signed with the initial ‘G’. Walter Edwards Freeman was the nephew of Richard Freeman (d.1710), from whom he took his last name, and from whom he inherited the estate of Batsford Park, Gloucestershire after the death of the latter’s son in 1745. The connection to Batsford had been strengthened by Walter’s marriage to Richard Freeman’s daughter Mary. The family group of enamels by Groth appear to have been commissioned in 1753 and this may have been to celebrate the marriage of Thomas Edwards to Elizabeth Reveley in that year. In 1978, Christie’s sold a portrait of Thomas Edwards’ wife, Elizabeth Reveley (spelt ‘Riveley’ on the enamel), also dated 1753. This enamel stated the important information that Groth was an appointed enamellist to King George II. This fact was further confirmed with official records noting Groth’s appointment from 1741, which also specified that Groth was to take the place of the previous ‘Painter in Enamel’ to the king, Bernard Lens. A portrait of an unknown lady at the National Trust property of Attingham Park, Shropshire shows that Groth painted in watercolour on ivory, as well as in enamel.